As the day progressed today (Thursday) I've begun to feel more like my healthier self. I'm still taking a cough suppressant/decongestant to relieve some cold symptoms: except for a little sniffle and the occasional clear cough, my outward symptoms are gone. No fever, no chills, and energy levels are coming back up. I'm feeling stronger and have more stamina. I'll be going in to work tomorrow. After watching a 2005 Biography Channel program about the Dalai Lama today, I've also been reminded I've been increasingly off-center in my life recently, mainly thanks to work. Sometimes we lose track of how we should live even when we think we're trying to do the right thing. Enough said, here. I received word this evening that my first of two ordered copies of the Microsoft Windows 7 Upgrade has been shipped to me via Amazon. I was actually hoping to have received it today –release day– so that I could mess with upgrading my notebook computer over the weekend. I doubt I'll get it before Monday and I'll be too busy next week to install. Oh well, sometimes the anticipation is more enjoyable than the activity… er, yes, in more things than this! Oh yes, it's good to feel well again… or to be headed in that direction! 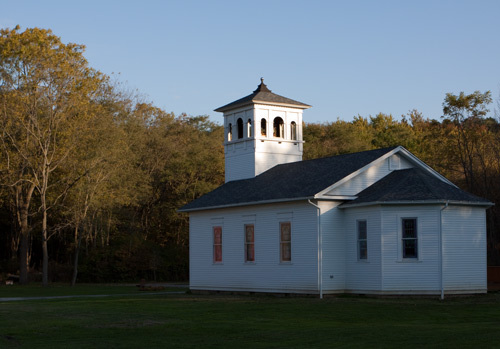 Above: Another photo from my Tuesday evening shoot along the West Branch of Rocky River… the Frostville Village Church. Another lovely photo! Do I see next year's calendar in the works?Glad you are feeling better.We often feel "off-center" especially when we are sick. Hope you find your true center soon.